Association of Medical laboratory science of Nigeria intensifies efforts to eradicate quackery – Royal Times of Nigeria. 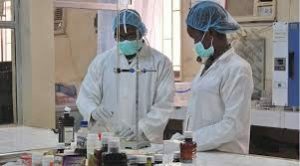 The association of Medical laboratory science of Nigeria has said that the association has intensified efforts to eradicate quackery in the profession. The chairman, Association of Medical laboratory science of Nigeria, Kwara state branch Mr Fowotade Adekunle stated this during a chat with newsmen in Ilorin to commemorate international biomedical laboratory science day celebrated on the fifteenth of April every year. According to Fowotade,the Medical Laboratory science council of Nigeria in conjunction with state associations periodically embarks on regular inspection of public and private laboratories to ensure that basic minimum standard in consonance with the checklist of the council is adhered to. Speaking further, fowotade also informed that professionals in the field must continually take part in continuous professional development programme (CPD) among other requirements. While commenting on the role of the association in curbing the scourge of bacterial meningitis, a member of the association Rasaki Adewole said the association will continue to carry out reseach in other to provide suitable vaccines. He also called on government to fund and open up vaccine production centers in the country.